Here at Centerpointe for Children, our goal is to provide you and your family with professional quality of care, under the guise of your child’s best day ever! We are experts at masking challenging goals as playful opportunities, and have a pretty fun time doing it! Occupational therapy refers to the practice of using meaningful and purposeful activities to promote development, independence, well being and enhancing quality of life. When working with the pediatric population, therapists examine the activities and roles that ‘occupy’ a child’s life, such as being a student, a playmate, and a family member. 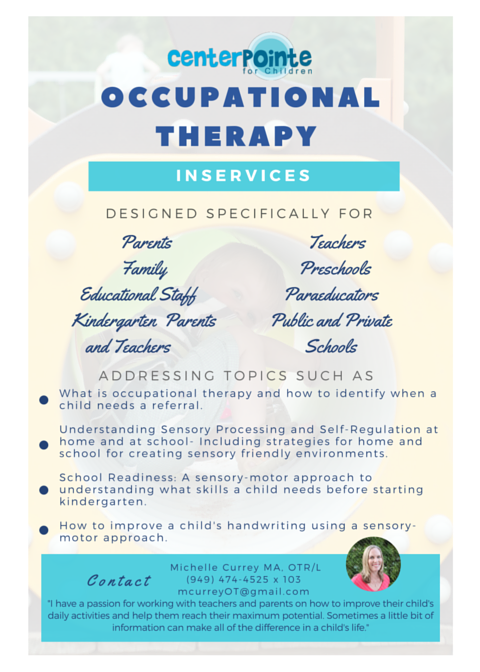 The goal of pediatric occupational therapy is to support participation in child centered activities with greater ease and independence by addressing motor skills, praxis, sensory-perceptual skills, emotional regulation, and social development. Occupational therapy intervention includes adapting the environment, modifying the task, teaching the skill, and family education in order to increase participation and performance in daily activities. Sensory integration is our brain’s ability to process sensory information from our body and environment, resulting in the child being able to respond successfully at home, at school, and in the community. The perception and organization of this information is how we develop an understanding of ourselves and the world around us. It supports our motor development, social and emotional growth, levels of alertness and ability to learn. Through a child’s active participation in his development, he promotes physical and emotional health, creates a strong sense of self and identity through engagement (alone and with others), and builds life skills and routines.